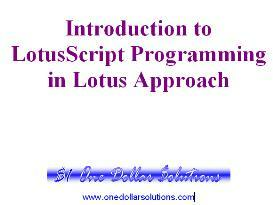 A complete Introduction to LotusScript Programming for Lotus 1-2-3 training guide in Adobe Acrobat pdf format. Packed with full colour screenshots, sample code and step-by-step instructions. Ideal as a handout/workbook for tutor-led training or as a self-study guide. Assumes no existing programming knowledge. Perfect for VBA prgrammers to understand differences in LotusScript, new LotusScript programmers or a refresher for more experienced users.